Fund My Mutual Fund: Is Copper Signaling a Slowing Global Economy? Is Copper Signaling a Slowing Global Economy? While I do like the gold aspect that is only 10% of sales; 80% of this company is copper. If there is indeed a global slowdown like I predict, copper is the type of base metal that will get hit first. The metal has been pretty weak the past 6-8 weeks as well. If I want exposure to metals I'd rather be in iron with some firm 1 year contract pricing (although in case of global slowdown people won't care about the 1 year pricing in iron either and toss out everything commodity related). ....but my whole portfolio is based on global growth and I'd rather be emphasizing more insulated growth themes at this stage such as agriculture and infrastructure. On the technical side, which I contend, many times gives the small investor a precursor of improving or deterioriating fundamentals that the large investor, many times with greater access to information, sees first - started to break down at that time. While many stocks had broken their 50 day moving average at the time, a week ago Tuesday was a huge rally day for the market and Freeport did not participate to enthusiastically. Technically, Freeport-McMoran has broken its 50 day moving average of $104, and is not bouncing much today, in fact flat as I write this. Hence I will exit the last of this position. Most of my purchases have been in the low to mid $80s and most of my sales have been in the $107 to $114 range, although today's sale of 75 shares was in the $99s. With the 200 day moving average down at $83-$84, I will take my own advice about a potentially slowing global economy and exit for now. In a declining market, its all about relative poison I suppose. Not much has been working but as I have been writing for a few months now, I have been cautious on the mining stocks simply because, while I do believe there is a long term global growth story happening, it will have ebbs and flows. And contrary to popular opinion, emerging markets will not be completely shielded from the US and Western European slowdowns - yes they have middle classes forming but the consumption power is nowhere near what 1st world Western economies bring to the table. So if those economies slow significantly, there will be impact. And this would hit base metals directly. Copper is essentially a proxy for growth as it is a building block in many industrial and residential offshoots. While China is very hard to "gauge" simply because many of their economic drivers have little to do with demand/supply but more governmental decisions to try to slow or accelerate the economy, recent comments/actions from the government indicate concern from officials about an overheated economy. 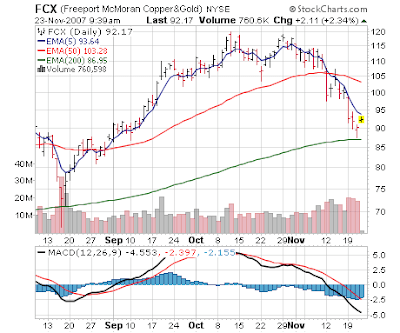 So with Freeport-McMoran breaking down from where I sold it (to the upper $80s) and the weakness in the copper market of late, is this signaling a pending global slowdown? Or just nervous investors? In a way it does not matter - because you can lose money either way. Perception "is" reality - especially in the stock market. We can see this in the treatment of Blue Coat Systems (BCSI) the past 40 days. Either way, I continue to be overweight areas I feel will be shielded from global slowdown of any sort - i.e. notice the agriculture stocks, while falling significantly as well, still sitting above key technical support - the 50 day moving average. At this point, unfortunately, on the long side a loss of 4% is considered a victory versus a loss of 10%. It's all relative! Below is a story from Forbes Wednesday about the copper market. Shares of copper-mining companies tumbled on Wednesday after investors already jittery about a slowing United States economy got some more bad news in the form of weak consumer confidence data, following on the heels of Tuesday’s disappointing housing-start numbers. Copper has been hit hard over the last few months as sagging real estate construction cut into consumption of the metal, sending prices down. Copper consumption in the U.S. is down 6% to 7% this year from last, said John Mothersole, metals analyst at Global Insight. Copper futures dropped 4.1%, to $2.94, on Wednesday afternoon. Charl Malan, metals and mining analyst for Van Eck Global Hard Assets Fund, said the downturn in copper prices is a continuation of the pattern over the last week where in the near-term prices for the metal are falling but the long-term outlook isn't so bad. Mothersole said there’s a negative sentiment sweeping through the copper market because of the accumulation of bad news. He said investors were optimistic after the Federal Reserve cut interest rates in September. The idea was the easing monetary policy would not only prevent the U.S. economy from slowing but stimulate growth and guarantee healthy construction activity and demand for copper in electronics through 2008. Mothersole said weak growth in the first half of 2008 will cause the U.S. residential construction rate to deteriorate, which in turn will hurt the copper market. At the same time, Mothersole said, Europe’s housing market troubles will slow growth there, cutting further into the copper market. The United States currently accounts for about 13% of global copper consumption, while China uses 20% to 30%. With the Chinese government concerned that its economic growth is dangerously strong -- it is running at about an 11.5% rate this year -- Beijing is looking for ways to manage a slowdown to prevent a boom- bust scenario, Mothersole said. Restricting real estate loans, increasing policy interest rates, increasing bank reserve requirements, and cancelling export tax rebates on a wide range of industries, which slows the growth of exports, are all ways the Chinese government is trying to down shift the economy from its extremely strong rates of growth. If the Chinese economy slows, the consumption rate of copper can be expected to slow with it.